Campaigners are suggesting walkers should pay to climb Mount Snowdon amid concerns too many people are visiting. There have been worries over damage to pathways and littering, and the Farmers' Union of Wales (FUW) suggests a path would protect Wales' highest peak for "future generations", reports the BBC. Gwynedd Watkin, FUW Caernarfon county executive, said it was something that needed to be done "in order to protect what we've got". A spokesman for Ramblers Cymru admitted that the high volume of walkers on Snowdon was "challenging" but suggested there was no legal basis for a charge as Snowdon's pathways are public rights of way and "are already maintain at the public expense". Speaking to the BBC, Jonathan Cawley, director of planning and land management at the Snowdonia National Park Authority, said other options should be explored to tackle the problem, including education. He said: "There's no one silver bullet. We spend huge sums on the upkeep of the maintenance of paths on Snowdon, but it's never enough. We do litter picking which is a huge task. There's an education programme that needs to happen." Mr Cawley suggested voluntary visitor gift schemes have helped at other sites, while Mr Watkin said this would not raise enough money. He suggested something more in line with an official permit, like the one needed to climb Peru's Inca Trail, or a tourism tax would be more beneficial, although admitted it would be hard to police. Ramblers Cymru said they would be happy with the idea of a voluntary payment scheme and encouraging more people to volunteer to help maintain Snowdon, but were not supportive of an official charge. According to Mountain Walk, Snowdon is the "friendliest" of the three highest peaks for the novice walker to ascend in the UK. There are six main routes to the summit, and you can always get the train back down if you're too tired to descend (trains run from mid-May to end of October, but don't run in bad weather). 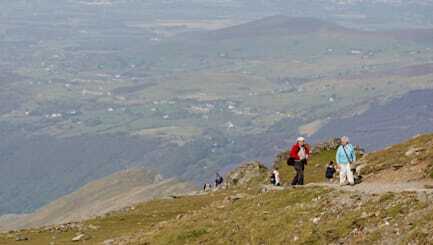 For more information about climbing Mount Snowdon, visit mountainwalk.co.uk. The Isle of Wight is a walker’s paradise, filled with over 500 miles of footpaths across contrasting landscapes and beaches, making it the ideal place for a walking holiday. The extensive network of footpaths can take you from a gentle meander along rural tree-lined paths to longer challenging hikes over open fields and chalk downs. The Isle of Wight Walking Festival, in May and October, is the largest in the UK and Europe. It provides the opportunity to take in the beautiful scenery and colours of the island. Alternatively, Wight Wanders offers self-guided walking holidays (from £235 for three-day breaks) throughout the year for those who like to walk independently, staying at a different place along the trail each night and even transporting your luggage. The New Forest is one of the best places in the country for walking breaks to suit every ability, with beautiful scenery in 300 square miles of open moorland and picturesque woodland, or 43 miles of wonderful coastline for beach or clifftop treks. New Forest rangers from the National Park or Forestry Commission offer expert-led walks for every level of walker, downloadable walks or Podcasts for your MP3 player with insider tips along the way. There are also New Forest Taste Trails for walks with stops to refuel at pubs, tearooms or restaurants. Stay at Hunter’s Moon, in Godshill, a family friendly holiday home snuggled away in the folds of the New Forest, from £825 for a weekend break. If you are looking for a walking holiday north of the border, why not follow in the footsteps of notorious Scottish outlaw Rob Roy MacGregor, who became a folk hero after escaping capture several times? The 80-mile Rob Roy Way goes through classic Highland scenery and areas that were his old haunts. It begins in Drymen, where the Clachan Inn is the oldest registered licensed pub in Scotland and would have been known by Rob Roy as it was run by his sister. The walk takes in the forests of the Trossachs and leads out through glens to Killin. The route then climbs high into the hills before descending to follow the quiet path along the southern shores of Loch Tay. A nine-day walking holiday with Sherpa Expeditions between April and October costs from £555 per person and is graded moderate with mostly hilly terrain, forest trails and some steep slopes. Home to some of the most attractive scenery in the UK, the Cairngorms National Park has a number of great walking routes for those of all abilities. Full of beautiful lochs, magical woodlands and incredible waterfalls, the National Park is a paradise of unspoiled countryside with amazing spaces to explore. Surrounded by imposing mountains and boasting astounding views, Loch Callater is a must-see for walkers. The historic route, known as Jock’s Road, leads to a bridge over the Callater Burn. The walk to the loch is fairly flat, making it easily accessible whether you’re an experienced walker or out with the family. Begin your quest in the car park beside Auchallater Farm and walk up to the beautiful loch nestled in between snowy peaks. Those visiting on longer journeys can rest their heads in the comfortable bothy, while others can walk the length of the loch before returning to civilisation. The bothy is free to stay in and walkers just need to bring a sleeping bag, mat and cooking gear. Enjoy the beautiful Kent coast on a walking holiday in Ramsgate, where there is plenty of remarkable architecture and natural wildlife to discover. The Contra Trail from Ramsgate to Pegwell Bay is a 6.1-mile walk brimming with fascinating contradictions, while taking in a Royal Harbour with the common touch, an English monument to a Viking invasion and a nature reserve you’ll want to shout about. If you love the sea, opt for the Sea It All trail from Ramsgate to Broadstairs which is five miles of coast hugging, cliff topping and cafe cruising, with beautiful Italian gardens and incredible views across Viking Bay, too. Stay at Glendevon Guest House in Ramsgate, which is walker-friendly and has some great facilities such as wet rooms, designed specifically for walkers. Isolated from the rest of the Western Highlands by a notorious strip of mountainous terrain, Scotland’s Knoydart Peninsula is often described as Britain’s last wilderness. Reached by boat, the Peninsula offers access to some of the best walking routes in Scotland. Knoydart offers remarkable mountains and a plethora of wildlife that make for an unforgettable guided walking holiday. Stay at a remote alpine-style wilderness lodge set right by the beach at Doune, among magnificent coastal and mountain scenery. Full use can be made of the sea, with passages to Skye and the Small Isles of Rum and Eigg, notable for their variety and distinctive landscapes and history. Part of a small group, you can experience hiking into the Black Hills, discovering the remote settlement at Airor and traversing the peninsula from north to south. Wilderness Scotland's Knoydart Peninsula walking holiday costs from £1,125 per person, including seven nights’ full board in a wilderness lodge, guiding and all boat transport. Hadrian's Wall Path National Trail is an unbroken 84-mile signposted route stretching coast to coast, from Wallsend in the east to Bowness-on-solway in the west. It passes through some of the most beautiful parts of England, from rolling fields and rugged moorland to the vibrant cities of Newcastle and Carlisle. Make your walk authentic by joining Wild Dog Outdoors' Roam with a Roman guided walk (£20 per adult, one child free). If you don't have time to walk the whole route, there are many circular walks available which take in some of the most scenic areas around the Wall. Stay in one of many B&Bs, self-catering cottages, campsites and bothies along the way, including Herding Hill Farm at Haltwhistle, a luxury five-star caravan, camping and glamping site. The six-mile Bath Skyline Walk is the National Trust’s most downloaded walk and features marked footpaths that take you along elevated routes, where you can enjoy views over Bath and its surrounding countryside. Discover hidden valleys which are rich in limestone and wild flowers on the beautiful route. You will also find attractions, such as Prior Park Landscape Garden with one of two of Bath’s Palladian bridges and Sham Castle. Walkers have the option of taking a guided tour with the City to Countryside Walk or the evening Sunset Skyline Walk. Stay at Brindleys (from £110 per night), a beautifully decorated boutique B&B full of character which is located very close to the start of the Bath Skyline walk. The curious assembly of 40,000 basalt columns of cooled molten lava on the north Antrim coast is the scene of some of Northern Ireland’s most exciting walking trails and paths, with easy paths, moderate strolls and more demanding hikes. From the cliff-top Giant’s Causeway Coastal Path overlooking the iconic pillars of the Giant's Causeway, this geological wonder suddenly seems smaller than the shadow it casts in heritage and culture. Stay at The Causeway Hotel from £99 per night. The hotel is located at the entrance to the Giant's Causeway and is the ideal place to stay for a short break. Follow the English/Welsh border for 177 miles along Offa's Dyke Path for a truly memorable walking holiday in Britain. Most hikers take around 12 days to complete the trail, while others tick off the walk in stages of two hours or even two days. The town of Hay-on-Wye, on the doorstep of the Brecon Beacons, sits on Offa's Dyke Path and offers a great base for walkers. Take a day trek, either to the north towards Kington and Knighton, or to the south, over Hay Bluff towards Abergavenny. Hay Retreats offers one or two-bedroom apartments in Hay-on-Wye, including first floor one-bedroom apartment Butter Market, with its king-size bed, modern bathroom and spacious living/dining area. A three-night stay costs from £280. For a unique walking holiday in Cornwall, head for the ancient Trelowarren estate on the Helford River to experience the Keeping Art in its Place walks. Ramblers can experience world-class art, healthy exercise and fabulous views rolled into one, before hunkering down in a gorgeous cottage. The walks take place over three or four days and take in artists, sculpture gardens and galleries, and run from St Hilary to Newlyn via Penzance, Helford and the Lizard or Carbis Bay and St Ives. The walks are offered to guests staying at the estate. Cottages cost from £575 per week for up to six people. East Hampshire is home to some of Britain's literary greats and offers walkers the chance to follow in the footsteps of writers, including Jane Austen and Flora Thompson, on six self-guided walks. The Shipwright’s Way is a new long-distance, 50-mile path linking villages and towns in East Hampshire, from Bentley, through Alice Holt Forest and Queen Elizabeth Country Park. The route features 20 sculptures, each depicting a story or aspect of the area where they stand. Looking for somewhere to stay? Try adults-only glamping in eco-pods at Two Hoots Campsite (from £60 per night for two guests), or Inadown Farm (from £279 for two guests for a three-night weekend break). The 186 miles of the Pembrokeshire coastline passes 58 beaches and 14 harbours. Britain's only truly coastal National Park can be enjoyed on the half-day Cemaes Head walk, which is especially lovely in the spring when you can see fulmars, cormorants and guillemots nesting on the highest cliffs of the National Park. And year-round you’re likely to spot chough, ravens, kestrels and buzzards, while also spotting bottlenose dolphins in the bay. The walk is along dramatic cliffs and offers amazing views. Celtic Trails offers a six-night Pembrokeshire walking holiday from £485 per person. The Wye Valley Walk has been extended from 111 miles to 136 miles (178km to 219km) to take in the source of the river Plynlimon. The valley offers some of the most marvellous scenery in Wales along the course of one of Britain's cleanest rivers, alive with salmon and trout. Walkers will be in border country and the Wye Valley Walk offers you a chance to see some epic architecture and wonderful towns. Look over the magnificent ruins of Tintern Abbey, browse through the antique shops of Ross-on-Wye and the famous bookshops at Hay. While on the walk, you will pass through dramatic gorges and woodland, rich in wildlife. Celtic Trails plans tailored walking holidays in the Wye Valley, whether a section of a walk in three days or all of it in a week. Accommodation is selected for you from a mixture of high standard friendly character B&Bs, farmhouses and small local inns. Your luggage will also be transported each day. From £475 per person. In Sussex, the South Downs Way and the High Weald Landscape Trail take walkers through hop gardens, orchards and villages, as well as iconic sites such as Birling Gap and the Seven Sisters. Ockenden Manor offers a Nordic Walking retreat with its resident Nordic Walker Jacob Parsons. Walks along the South Downs Way and High Weald Landscape Trail are combined with massages and Michelin-starred dining. The two-night Nordic Walking break (5 and 6 September 2015) costs from £350 per person, including accommodation, full English breakfast, two massages, two dinners, a picnic lunch and an extensive programme of Nordic walking. Hike around the biggest man-made lake in Europe as part of a breathtaking short break to Northumberland. The 23.5-mile route of the Kielder Challenge Walk is easy to navigate, but with a rating of difficult, it’s certainly no stroll in the park. After your walk you can stay on-site in a luxury lodge, soothe your aching feet in a relaxing hot tub, or visit the sauna or indoor pool. A three-night weekend break for four at Kielder Lodges in September costs from £396 with Hoseasons. Book a place for the Kielder Challenge Walk online.